Happy Labor Day weekend! This weekend has managed to be a mix of both super busy & super lazy! Since Friday, I have visited 5 different wedding venues with different family members & boy it is a lot of work! There are so many details to think about and questions to ask, so if we haven't been at venues, we have been super lazy spending the weekend out east. I don't even mind that the weather hasn't been great - it's been nice to catch up on TV, take some naps & spend time with family. Hope you all are enjoying the last 'official' weekend of summer as much as I am. 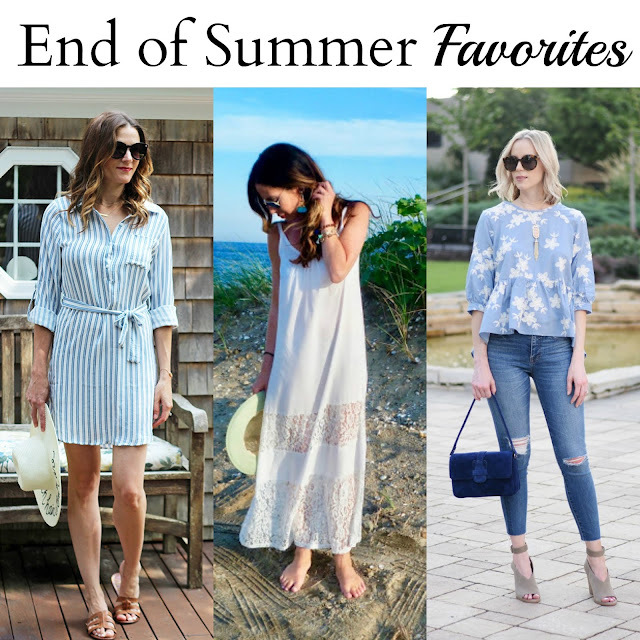 With a new season comes fun new link up themes & a new host for our weekly linkup! 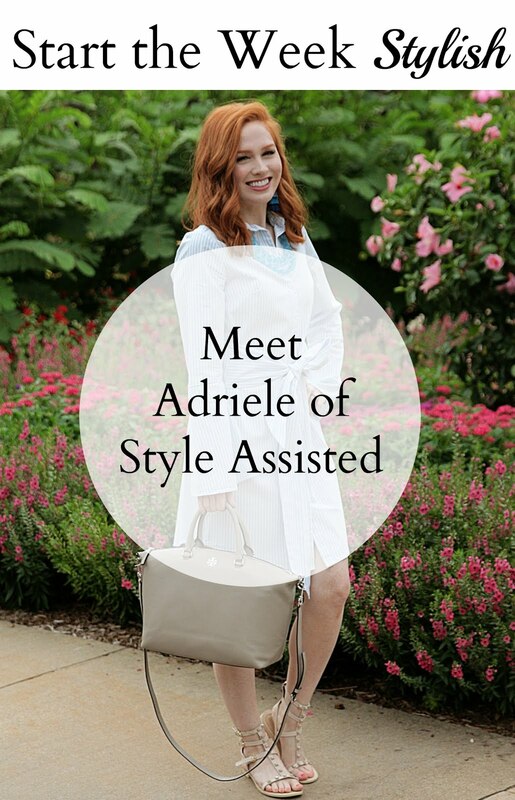 I am so excited to welcome Adriele from Style Assisted as our third weekly host! Adriele has super cute, stylish, & colorful outfits and had linked up with us weekly and guest hosted multiple times so she seemed like the perfect addition to our link up! We are excited for our bigger & better link up moving forward & promise you lots more great themes through the upcoming seasons! If you have any ideas for themes, leave them in the comments & we will be sure to incorporate them! Last week we loved Elise from Sparkle & Slippers, Amy from Straight A Style & Rachael from Threads for Thomas. 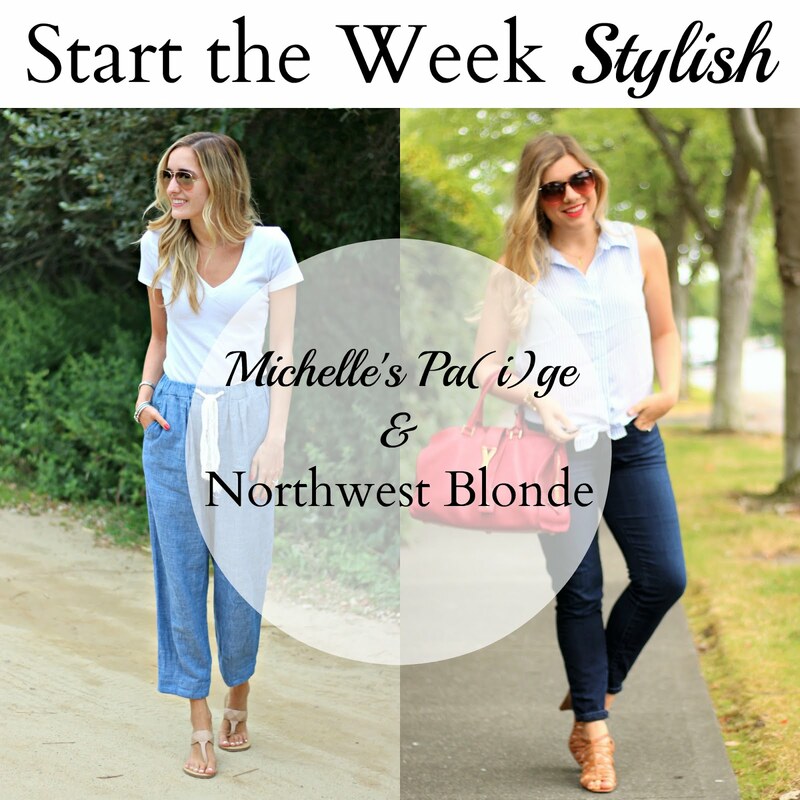 Michelle, I love this easy casual outfit for cool holiday weekend vibes! I just purchased a very similar outfit for myself that I may be styling today. You look fabulous! How fun! I would love to see how you styled a similar outfit. I love those pants! They make me hate to see summer end. Great look! Me too - luckily we still have some nice weather in this area. That outfit looks so cozy. I just love those pants! Those pants look so comfy! Love this casual look on you! Such a cute outfit! Thank you for the feature!! Loved your chic look last week! This is a perfect weekend outfit, Michelle! It looks amazingly comfy! Those pants look great! Looks so comfy and stylish at the same time! It sounds like you had a busy weekend! Love how comfortable your outfit looks! Don't mean to sound creepy, but what's the brand of the bra you're wearing with this white T? It looks really seamless! Those pants are so cute and look so comfy! I love this laid back look! Thank you for the feature. These trousers are so cool, doll! Love 'em! Visiting venues is SO fun! But also super exhausting. I love your pants so much! I love this look! The casual pants are stylish and comfy! Those pants looks extremely comfy! I need to get a pair for myself! They are totally worth it - very comfortable. Love this chic and casual outfit! The perfect combination! I love your casual, easy and adorable style! I too mixed busy with lazy this weekend. In fact, my husband took the boys for me one of the days and I napped and finished the PBS series, Victoria. It was wonderful! Thank you for hosting! Sounds like such a relaxing weekend! That's a really cute outfit! I love the pants, the color is perfect. I love your outfit, it's so casual, yet chic!